William Palmer (6 August 1824 – 14 June 1856), also known as the Rugeley Poisoner or the Prince of Poisoners, was an English doctor found guilty of murder in one of the most notorious cases of the 19th century. Charles Dickens called Palmer "the greatest villain that ever stood in the Old Bailey". Palmer was convicted for the 1855 murder of his friend John Cook, and was executed in public by hanging the following year. He had poisoned Cook with strychnine, and was suspected of poisoning several other people including his brother and his mother-in-law, as well as four of his children who died of "convulsions" before their first birthdays. Palmer made large sums of money from the deaths of his wife and brother after collecting on life insurance, and by defrauding his wealthy mother out of thousands of pounds, all of which he lost through gambling on horses. 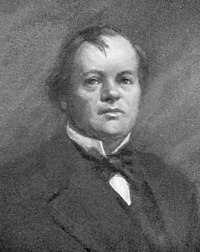 Born in Rugeley, Staffordshire, William Palmer was the sixth of eight children to Sarah and Joseph Palmer. His father worked as a sawyer, and died when William was 12, leaving Sarah with a legacy of some £70,000. As a seventeen-year-old, Palmer worked as an apprentice at a Liverpool chemist, but was dismissed after three months following allegations that he stole money. He studied medicine in London, and qualified as a physician in August 1846. After returning to Staffordshire later that year he met plumber and glazier George Abley at the Lamb and Flag public house in Little Haywood, and challenged him to a drinking contest. Abley accepted, and an hour later was carried home, where he died in bed later that evening; nothing was ever proven, but locals noted that Palmer had an interest in Abley's attractive wife. He returned to his home town of Rugeley to practice as a doctor, and, in St. Nicholas Church, Abbots Bromley, married Ann Thornton (born 1827; also known as Brookes as her mother was the mistress of a Colonel Brookes) on 7 October 1847. His new mother-in-law, also called Ann Thornton, had inherited a fortune of £8,000 after Colonel Brookes committed suicide in 1834. She died on 18 January 1849, two weeks after coming to stay with Palmer; she was known to have lent him money. An elderly Dr Bamford recorded a verdict of apoplexy. Palmer was disappointed with the inheritance he and his wife gained from the death, having expected it to be much greater. Palmer became interested in horse racing and borrowed money from Leonard Bladen, a man he met at the races. Bladen lent him £600, but died in agony at Palmer's house on 10 May 1850. His wife was surprised to find that Bladen died with little money on him, despite having recently won a large sum at the races; his betting books were also missing, so there was no evidence of his having lent Palmer any money. Bladen's death certificate listed Palmer as "present at the death", and stated the cause of death as "injury of the hip joint, 5 or 6 months; abscess in the pelvis". Elizabeth Palmer. Died on 6 January 1851. She was about two and a half months old at the time of death. Henry Palmer. Died on 6 January 1852. He was about a month old. Frank Palmer. Died on 19 December 1852, only 7 hours following his birth. John Palmer. Died on 27 January 1854. He was three or four days old. As infant mortality was not uncommon at the time, these deaths were not initially seen as suspicious, though after Palmer's conviction in 1856 there was speculation that he had administered poison to the children to avoid the expense of more mouths to feed. By 1854 Palmer was heavily in debt, and he began forging his mother's signature to pay off creditors. He took out life insurance on his wife with the Prince of Wales Insurance Company, and paid out a premium of £750 for a policy of £13,000. The death of Ann Palmer followed on 29 September 1854, at only 27 years old. She was believed to have died of cholera, as a cholera pandemic was affecting Great Britain (causing 23,000 deaths across the country). Still heavily in debt, with two creditors (whom he owed £12,500 and £10,400) threatening to speak to his mother (thereby exposing his fraud), Palmer attempted to take out life insurance on his brother, Walter, for the sum of £84,000. Unable to find a company willing to insure him for such a sum, he instead returned to the Prince of Wales Insurance Company, paying out a premium of £780 for a policy of £14,000. Walter was a drunk, and soon became reliant on his brother, who readily plied him with several bottles of gin and brandy a day. Walter Palmer died on 16 August 1855. However the insurance company refused to pay up, and instead dispatched inspectors Simpson and Field to investigate. The pair found that William Palmer had also been attempting to take out £10,000 worth of insurance on the life of George Bate, a farmer who was briefly under his employment. They found that Bate was either misinformed or lying about the details of his insurance policy, and they informed Palmer that the company would not pay out on the death of his brother, and that they further recommended a further enquiry into his death. At about this time, Palmer was involved in an affair with Eliza Tharme, his housemaid. On 26 June/27 June 1855, Tharme gave birth to Alfred. He was an illegitimate son to Palmer, increasing the financial burdens on the beleaguered physician. With Dr. Palmer's life and debts spiralling out of control, the physician then planned the murder of his erstwhile friend John Cook. John Parsons Cook, a sickly young man with an inherited fortune of £12,000, was a friend of Palmer. In November 1855, the pair attended the Shrewsbury Handicap Stakes and bet on various horses between 13 and 15 November. Cook won £3,000 by betting on "Polestar"; Palmer lost heavily by betting instead on "the Chicken". Cook and Palmer had a celebration party at the Raven, a local drinking establishment. Already on 14 November, Cook was complaining that his gin had burnt his throat; Palmer responded by making a scene in which he attempted to convince bemused onlookers that there was nothing untoward in Cook's glass. Afterwards Cook was violently sick, and told two friends, George Herring and Ishmael Fisher, that "I believe that damn Palmer has been dosing me". On 15 November, Palmer and Cook returned to Rugeley, at which point Cook booked a room at the Talbot Arms. Earlier on 14 November Palmer had received a letter from a creditor named Pratt, who threatened to visit his mother and ask for his money if Palmer himself would not pay up soon. The following day he bet heavily on a horse, and lost. Having seemingly recovered from his illness, Cook met with Palmer for a drink on 17 November, and soon found himself sick once again. At this point Palmer assumed responsibility for Cook; Cook's solicitor, Jeremiah Smith, sent over a bottle of gin, which Palmer had in his possession before he sent it. Chambermaid Elizabeth Mills took a sip of the gin and subsequently fell ill; Cook was given the rest of the gin, and his vomiting became worse than ever. The next day, Palmer began collecting bets on behalf of Cook, bringing home £1,200. He then purchased three grains of strychnine from the surgery of Dr Salt, and put the grains into two pills, which he then administered to Cook. On 21 November, not long after Palmer administered two ammonia pills, Cook died in agony at about 1:00 AM, screaming that he was suffocating. On 23 November, William Stevens, Cook's stepfather, arrived to represent the family. Palmer informed the deceased had lost his betting books, which he further claimed were of no use as all bets were off once the gambler had died; he also told Stevens that Cook had £4,000 in outstanding bills. Stevens requested an inquest, which was granted. Meanwhile, Palmer obtained a death certificate from 80-year-old Dr Bamford, which listed the cause of death as 'apoplexy'. A post-mortem examination of Cook's body took place at the Talbot Arms on 26 November, carried out by medical student Charles Devonshire and assistant Charles Newton, and overseen by Dr Harland and numerous other onlookers. Newton was drunk, and Palmer himself interfered with the examination, bumping into Newton and taking the stomach contents off in a jar for 'safe keeping'. The jars were sent off to Dr Alfred Swaine Taylor, who complained that such poor quality samples were of no use to him, and a second post mortem took place on 29 November. Postmaster Samuel Cheshire intercepted letters addressed to the coroner on behalf of Palmer; Cheshire was later prosecuted for interfering with the mail and given two years in prison. Palmer also wrote to the coroner himself, requesting that the verdict of death be given as natural causes, enclosing in his letter a £10 note. Dr Taylor found no evidence of poison, but still stated that it was his belief that Cook had been poisoned. The jury at the inquest delivered their verdict on 15 December, stating that the "Deceased died of poison wilfully administered to him by William Palmer"; at the time this verdict could be legally handed down at an inquest. Double page feature on the trial of William Palmer in the Illustrated Times, 27 May 1856. Palmer was arrested on the charge of murder and forgery (a creditor had told the police his suspicions that Palmer had been forging his mother's signature) and detained at Stafford Gaol; he threatened to go on hunger strike, but backed down when the governor informed him that this would lead to his being force fed. An Act of Parliament (the Central Criminal Court Act 1856) was passed to allow the trial to be held at The Old Bailey in London, as it was felt that a fair jury could not be found in Staffordshire, where detailed accounts of the case and the deaths of his children were printed by local newspapers. However, an alternative hypothesis is that Palmer was a popular figure in Rugeley and would not have been found guilty by a Staffordshire jury: the implication being that the trial location was moved for political reasons so as to secure a guilty verdict. Lord Chief Justice Campbell—the senior judge at Palmer’s trial—suggested in his autobiography that, had Palmer been tried at Stafford Assizes, he would have been found not guilty. The Home Secretary also ordered that the bodies of Ann and Walter Palmer be exhumed and re-examined; Walter was too badly decomposed, though Dr Taylor found antimony in all the organs in Ann's body. His defence was led by Mr Serjeant William Shee. The defence case suffered adverse comment from the judge because Shee had, against all rules and conventions of professional conduct, told the jury that he personally believed Palmer to be innocent. The prosecution team of Alexander Cockburn and John Walter Huddleston possessed fine forensic minds and proved forceful advocates, especially in demolishing defence witness Jeremiah Smith, who had insisted that he had no knowledge of Palmer's taking out life insurance on his brother, despite Smith's signature being on the form. Palmer expressed his admiration for Cockburn's cross-examination after the verdict through the racing metaphor "It was the riding that did it." Circumstantial evidence came to light: Elizabeth Mills said that as Cook was dying he accused Palmer of murder; Charles Newton also told the jury that he had seen Palmer purchasing strychnine; chemist Mr Salt admitted selling Palmer strychnine in the belief that he was using it to poison a dog, he also admitted that he had failed to record the sale in his poisons book as required by law; Charles Roberts, another chemist, also admitted selling Palmer strychnine without noting the sale in his poisons book. Palmer's financial situation was also explained, money lender Thomas Pratt telling the court he lent money to the accused at 60% interest, and bank manager Mr Stawbridge confirming that Palmer's bank balance had stood at £9 at 3 November 1855. The cause of Cook's death was hotly disputed, with each side bringing out medical witnesses: Dr Bamford was ill but his stated cause as congestion of the brain was dismissed by other witnesses and the prosecution told the jury that he had become mentally suspect in his old age; the prosecution witnesses, including Dr Taylor, stated the cause of death as 'tetanus due to strychnine'. Few medical witnesses actually had any experience in human cases of strychnine poisoning and their testimony would have been considered weak by 21st-century standards. Shee summed up his case to the jury by stating that "[if the prosecution were correct] Never therefore, were circumstances more favourable for detection of the poison and yet none was found." He summoned fifteen medical witnesses who stated that the poison should have been found in the stomach (the contents of which had disappeared during the post-mortem). The prosecution had the last word, and an image was painted of Palmer as a man desperately in need of money in order to avoid debtors' prison, who murdered his friend for his money and who had covered his tracks by sabotaging the post-mortem. The jury deliberated for just over an hour before returning a verdict of guilty. Lord Campbell handed down a death sentence, to no reaction from Palmer. "Cook did not die from strychnine." "This is no time for quibbling – did you, or did you not, kill Cook?" "The Lord Chief Justice summed up for poisoning by strychnine." Some scholars believe that the evidence should not have been enough to convict him, and that the summing up of the judge, John Campbell, 1st Baron Campbell, was prejudicial. On 20 May 1946, The Sentinel published a final piece of evidence not included in the trial, found by Mrs E. Smith, widow of the former coroner for South West London; it was a prescription for opium written in Palmer's handwriting, on the reverse of which was a chemist's bill for 10d worth of strychnine and opium. A wax effigy of Palmer was displayed in the Chamber of Horrors at Madame Tussaud's waxwork museum from 1857 until 1979. The fictional character of Inspector Bucket in Charles Dickens's Bleak House is reputed to be based on Charles Frederick Field, the policeman who investigated Walter Palmer's death for his insurers. Dickens called Palmer "the greatest villain that ever stood in the Old Bailey". The salutation "What's your poison?" is thought to be a reference to the events. The film The Life and Crimes of William Palmer was released in 1998, with Keith Allen playing the part of Palmer. In the Sherlock Holmes short story, "The Adventure of the Speckled Band", while commenting on the apparent villain, Dr. Grimesby Roylott, Holmes tells Dr. Watson that when a doctor goes bad he is the first of criminals. He then illustrates this with the comment that Drs Palmer and Pritchard were at the "head of their profession". Since neither was considered a good doctor, and Pritchard was considered something of a quack by the medical fraternity in Glasgow, the "profession" involved was that of murder. 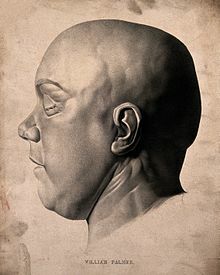 The incident involving Palmer at the autopsy of Cook is referred to in Dorothy L. Sayers's murder mystery novel The Unpleasantness at the Bellona Club. The doctor doing the post-mortem on the victim says, as he transfers the stomach contents to a jar: "...Look out! You'll have it over. Ha! ha! That was a near thing. Reminds me of Palmer, you know - and Cook's stomach - always think that a very funny story, ha! ha!..." William Palmer was portrayed by actor Jay Novello on the CBS radio series Crime Classics in the 7 October 1953 episode entitled "The Hangman and William Palmer, Who Won?" Robert Graves's final historical novel, "They Hanged My Saintly Billy" (1957), defends Palmer, offering Graves's trademark "reconstruction of a damaged or maligned reputation" (p. xxv). Alfred Hitchcock's 1941 film Suspicion makes a reference to "Richard Palmer", a notorious fictional murderer who poisoned an acquaintance in a pub via spiked libations - during the discussion between Joan Fontaine's character, Lina, and Isabel Jeans' character, Mrs. Newsham (a popular author of murder mystery novels within the movie plot), details of this historical case make an obvious reference to William Palmer's murder of Cook. In the novel Phineas Redux (1873) by Anthony Trollope lawyers defending Phineas Finn against a charge of murder make an abstruse allusion to the case, confident that it still would be recognised, implying that Palmer had been wrongly convicted and hanged and that their client, to avoid a similar fate, should avoid giving too detailed an account of his movements on the night of the crime. ^ a b c d e f g h i j k l m n o p q r s t u v w x y z aa ab ac ad ae af ag ah ai aj ak al am an ao ap aq ar as at au av aw ax ay az ba bb bc bd be bf bg bh bi bj bk bl Hayhurst, Alan (2008). Staffordshire MURDERS. Gloucestershire: The History Press. pp. 15–36. ISBN 978-0-7509-4706-0. ^ a b Charles Dickens (1856). "The Demeanor of Murderers". Household Words. Bradbury & Evans. Retrieved 2 July 2014 – via Old Lamps For New Ones, And Other Sketches and Essays Hitherto Uncollected, page 269. ^ a b "Key Dates". William Palmer. Retrieved 1 November 2016. ^ "Cholera's seven pandemics". 2 December 2008. Retrieved 11 December 2008. ^ Lewis, Dave (1 May 2003). "The 'Palmer Act' allows trial to be in London". William Palmer: The infamous Rugely poisoner. Retrieved 21 August 2018. However another version is that he was very popular and would not have been found guilty had he been tried locally. Lord Justice Campbell who was the senior judge at Palmer’s trial suggested in his autobiography that, had Palmer been tried at Stafford Assizes, he would have been found not guilty. This contradicts the stories in the press that the trial was switched to London because in Staffordshire people were so biased against Palmer that he would have automatically been found guilty. ^ Wade, Stephen (2009). Britain's Most Notorious Hangmen. Wharncliffe Local History. pp. 92–94. ISBN 978-1-84563-082-9. ^ Bell, David (2005). "9". Staffordshire Tales of Murder & Mystery. Murder & Mystery. Countryside Books. p. 86. ISBN 978-1-85306-922-2. ^ "Arrival of the Niagara". Morning Journal. 16 July 1856. Retrieved 19 August 2016. ^ Leavesley, Jim (2010). Not Your Ordinary Doctor. Crows Nest, NSW, Australia: Allen & Unwin. p. 294. ISBN 9781742373300. ^ Phineas Redux Chapter 60 "Two days before the trial"
Knott, G. H. (1912). The Trial of William Palmer (Notable English Trials ed.). Edinburgh: William Hodge & Co. The Trial of William Palmer for the Alleged Rugeley Poisonings. London: James Gilbert. 1856. McCormick, Ian. (Ed.) Antigua, Penny, Puce AND They Hanged My Saintly Billy. London Carcanet Press, 2003. Wikimedia Commons has media related to William Palmer (murderer).